‘Cape Town tower, Papa, X-ray, Juliet, good day and ready for lift,” my “baby” sister, Rudi Botha, says into the microphone of her noise-cancelling aviation headset. This is not a simulation and I’m most definitely not dreaming – except, when did the student transform into a tough-as-nails 24-year-old woman? We’re sitting in a two-seater Robinson 22 helicopter (RH22) as the engine warms up for takeoff. The rotor blades are gathering speed, and sweat is pouring down our faces as the temperature in the tiny cabin climbs. Rudi’s reflective aviator sunglasses could not get more Tom Cruise, except this movie is more Top Girl than Top Gun, with the two of us about to helicopter into the blue yonder, like Thelma and Louise. I repeat, this is not a simulation. “Papa, X-ray, Juliet, lift own discretion. Remain west of runway one niner. Wind two one zero degrees, one two knots,” a male voice comes over the radio. “Lift own discretion. Remain west. Papa, X-ray, Juliet,” Rudi chimes back. 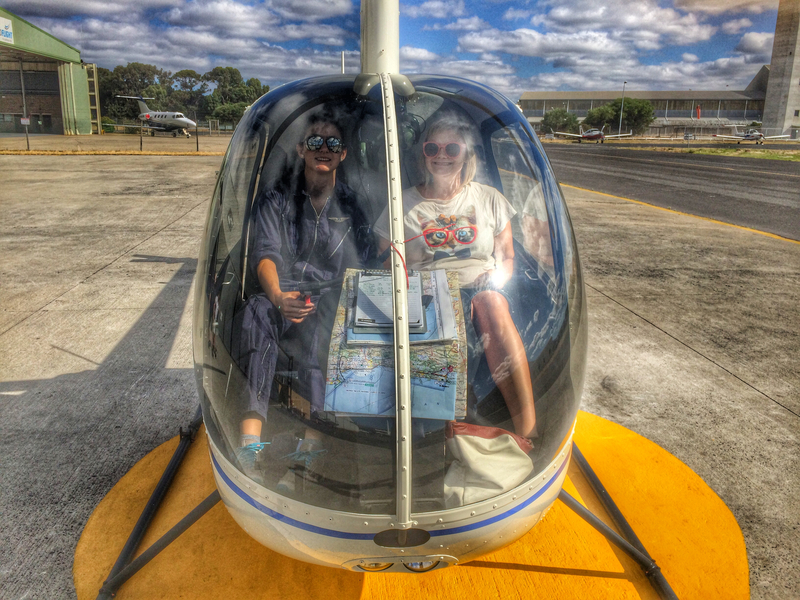 A qualified private helicopter pilot, Rudi has been adding flying hours towards her commercial licence for the past two years, and has about 75 of 200 left to go. Her school replaced the engine and main rotor blades on one of its RH22 choppers – the bodies last 6?600 hours, the engines up to 2?200 hours and the main rotor blades 2?000 hours. New engines need to be broken in with 25 hours of flying at maximum continuous power – ideal for high-speed, long-distance flights – before the helicopter can be used for the slower, more precision aspects of training. So Rudi offered to take it for a spin around the country over the festive season, and we were up and away with the aquamarine of False Bay melting into the horizon on one side, mosaics of tin roofs below our feet and dark green mountains up ahead. It was my first time in a helicopter – no half measures for me – and I was so relieved to be feeling fine, over-the-moon excited to be on the brink of an unchartered experience, and gloating about my new Airwolf ringtone. It was time to take a selfie. The plan was to take two days to fly up to the Free State over the Karoo, spend Christmas with our father on the farm, then take three days to fly back along the Wild Coast and Garden Route. No, helicoptering in a RH22 is not really faster than driving when it comes to long distances, mostly because of the fuel stops every two hours or so – and we also had to wait out bad weather, sometimes for days. The changing weather also makes it nearly impossible to book accommodation. Nevertheless, we still took the opportunity to smirk down at the Somerset West traffic pile-up and shrug at the escalating daily road-deaths reports, although it didn’t stop our mother’s frantic hourly WhatsApp messages. The unmanned and noncommercial airstrips are a story unto themselves – a backstage of contemporary life that none of us ever see, and far grittier than Alain de Botton’s A Week at the Airport. From the Jägermeister-bottle-lined clubhouse, replete with ties and G-strings nailed to the bar in Swellendam, to the ghost-like Graaff-Reinet airstrip, its tarred surface pointing to a more illustrious history now left to sunset photo collages, a very shy parrot and no running water. The rather preppy Gariep Dam airstrip was home to the only other female voice we heard on the radio, belonging to the part-time air traffic information provider who keeps an eye out for the fleet of leisure gliders. hills like belly rolls and valleys like stretch marks, trains like mercury running up a thermometer, cows like omega seeds, rivers like wounds and gashes, shorelines like fractals and dams like mirror shards. Different areas had different textures – the Karoo had a smooth fur-like layer of grass with a range of rich colourings mimicking animal prints. The Valley of Desolation was rough and hard, like a macroscopically enlarged gravel road, with scratches revealing fiery red soil beneath. The most geometric, like a meticulously laid out lappieskombers, was the Free State, while the KwaZulu-Natal hillocks showed a geometry of interlocking circles. The Wild Coast looked like a pristine golf course and, coming back to the Western Cape, it was all of the above – the most diverse. From up there, the geopolitics of South Africa is also laid out for all to see: towns shaped like lopsided bow ties with large houses camouflaged by leafy streets and neon-blue swimming pools winking up from one side, and corrugated iron matchbox dwellings tightly gridlocked in a stark mirror image on the other side. Working the nine-to-five in a city, one can get quite mentally stuck in the global urbanisation project of the 20th century – you know, “cities are the future” kind of thing – but there are thousands of kilometres and tens of hours between moderate sprinklings of human life out there. Entire expanses, especially on the Wild Coast and in the Valley of Desolation, had no signs of human life. Time and space is different out there in the middle of nowhere. Take, for instance, the Owl House in Nieu Bethesda, which is the prolific artistic output of 31 years of Helen Martins’ life squeezed into a single museum. In the 21st century, investing that amount of time into any project is hard to wrap your mind around. Even 200 hours towards a commercial licence sounds like a lot. We flew around the country in 24 hours – the same amount of time it takes the earth to circle the sun – and less than a week later, we’re back at our office jobs. Yet everything feels different. Anything feels possible. And that’s a holiday feeling worth having when starting off the new year.